I'm alive!! I thought for sure I was going to die the last few days, but as I now remember it turns out when you have the flu you only feel like you're going to die. I woke up in the middle of the night before my last day of class in New Braunfels with an elephant sitting on my head and body. I took massive amounts of pain killer to prop myself up and make it through the day. Then I called my mom and asked if I could visit and have her take care of me until I was better. Finally the elephant moved on ... only to settle on top of my dad. Oh man. So now I'm about ready to head home but I'm leaving pain in my wake. I feel really bad about this! The space we were in was very nice, though relatively small. 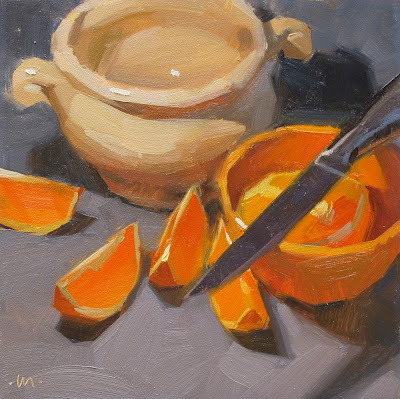 Mary McIntosh's still life collection puts mine to shame. You can only see a little of it on the shelves in these photos, but we had access to lots of great stuff, which came in really handy. I'll have to post the group photo a little later. I was so out of it the last day - we did take one but not me and I'm having it emailed. I hope all my kids are happy and healthy and painting away!! Glad to hear that you are feeling better! Love your painting and the title is wicked! I feel your pain. Really. I had it too a couple of weeks ago, and just lay around in bed for about three days. Sorry you passed it on to your dad. Hope you are feeling better. 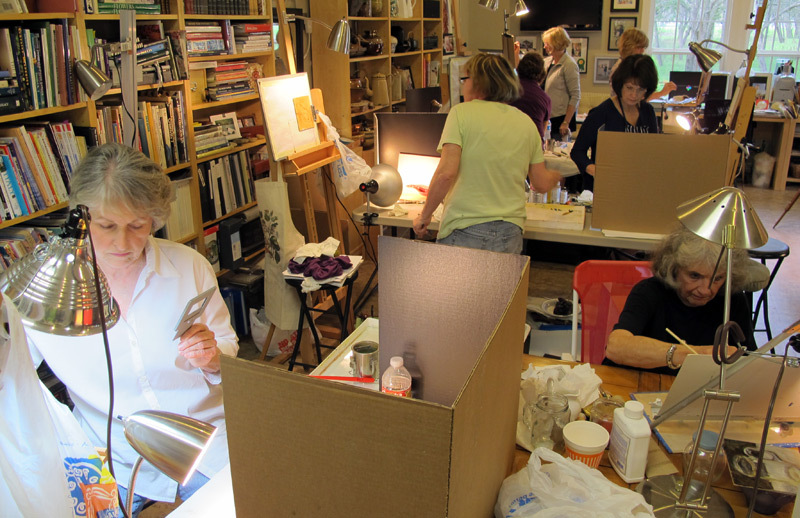 I was so glad to get into one of Carol's workshops. It was lots of fun (she's not nearly as mean as she sounds on her blog). There were wonderful people and the B and B in New Brunfels was fantastic. 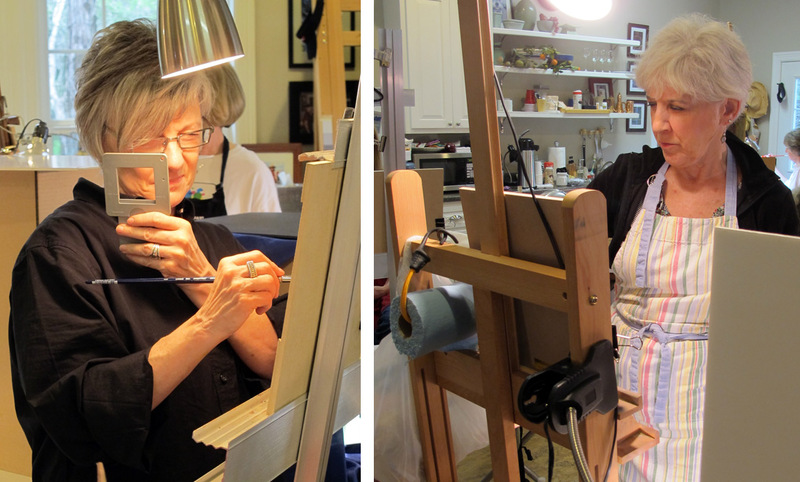 I've been painting a long time but still learned so much from Carol's clear and direct approach. I highly recommend a workshop with her, it was one of the best I've ever attended, and worth the wait! We missed you, so sorry to hear you were ill. Love this new still life, you are always so creative with your titles. I painted one recently with a knife and oranges and called it "Slicing Oranges" lol. I really need to work on my titles. I'm glad to see that you're back among us! I was getting a little worried! Your workshop looks like everything I've been searching for....I have to get into one! I just retired and want to get back into painting again and I have been searching the internet for two months looking for classes/workshops like this one. It's perfect, everything I'm looking for. I'm so excited, wish you were in Minnesota but CA in the winter would be perfect!